Obama is set to speak with Chinese President Xi Jinping and Indian Prime Minister Narendra Modi before traveling to his last stop in Paris, The Hill reported on Tuesday. A spokesman for the former president said Obama will speak at various summits in the three countries he visits. 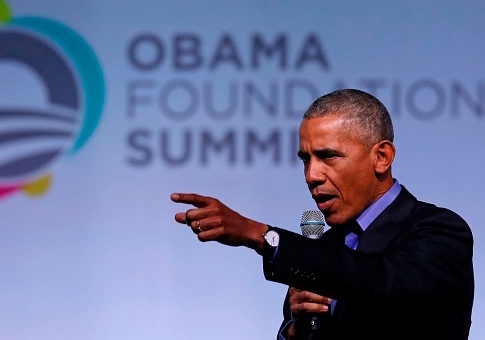 The Washington Examiner noted the Obama Foundation will also be hosting a town hall on Friday in New Delhi to "expand the conversation about what it means to be an active citizen and make an impact." During his presidency, Obama often faced challenges in his relationship with Xi, including on the issue of Chinese government hackers directing attacks on the United States. Obama ultimately backed away from harsh economic sanctions in response to cyber attacks and the two leaders reached a "common understanding" in September 2015 to not conduct or support cyber espionage and intellectual property theft for the purposes of commercial gain. Private researchers, however, found in the weeks following that hackers frequently penetrated the networks of U.S. companies despite Xi's pledge not to do so, the Washington Post reported at the time. The former president’s trip comes shortly after President Donald Trump concluded his 12-day five-nation tour of Asia where he met with both Xi and Modi. First daughter and White House senior adviser Ivanka Trump just met with Modi during the Eighth Annual Global Entrepreneurship Summit in Hyderabad. She will be in India until Thursday. During her speech at the summit, Ivanka Trump spoke about female entrepreneurs, continuing her focus on addressing women’s issues. This entry was posted in Politics and tagged Barack Obama, China, Donald Trump, India, Ivanka Trump, Xi Jinping. Bookmark the permalink.